Microsoft Exchange is the world's most widely deployed email and collaboration solution. With Exchange 2007, Microsoft continues to improve the product and push the limits of existing server and storage devices. 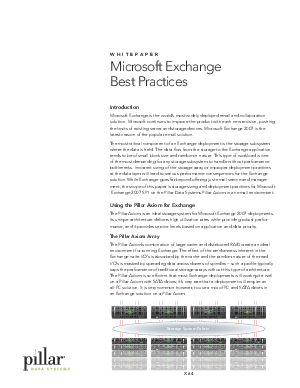 Download this informative white paper to learn why you must take the following into consideration for a successful Microsoft Exchange implementation: Storage configuration: DAS vs. SAN; Sizing metrics for Exchange, including user I/O profiles; Capacity requirements; Considerations for Storage Group, Volume, and LUN Design. Download this informative white paper now!